Description: A BNSF track geometry train has just turned on the wye on UP's Gouldsboro Subdivision just across the Mississippi River from New Orleans. This trackage is within the first 10 miles of the original Texas & Pacific Railway. The completion of the Huey P. Long Bridge (within view of both the crew and the photographer) in the 1930s made this trackage a dead-end branchline. Description: Shuffling around the shops. Description: 2703 and 2761 await their next call at the fuel racks on a cold January day. Description: Snowing at the fuel racks. 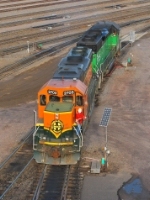 Description: BNSF 3001 & 2703 resting on the siding at Dakota Plains Ag Center in Parkston, SD. Description: Westbound on a crappy day. Description: I couldn't make out the number of the locomotive in the shed. I think its 2703 but if anyone knows what its number is, please let me know.